The AOR team anticipates which position battle will win the war for the 2018 Currie Cup title at Newlands on Saturday. In the 2017 final, loosehead prop JC Janse van Rensburg’s demolition job on Ross Geldenhuys went a long way to securing the trophy for the Blue and White. This year, Ali Vermaak, deputy to JC in 2017, will be tasked with doing something similar – against a guy who in the equivalent fixture in Durban just 12 months ago was packing down at loosehead for the Sharks. Confusing? Indeed! Throw in the fact that the likely tighthead on the bench for the Sharks on Saturday, Coenie Oosthuizen, is also a retreaded loosehead, and you have the golden head-to-head right there – Vermaak vs Thomas du Toit. Stock up the coolerbox, fire up the kameeldoring, load the grid, sit back and enjoy! Du Toit, a truly world-class loosehead in his own right, was asked to move to the other side of the scrum by the powers that be, and has been taking baby steps along an incredibly tricky path. He goes okay when the waters are calm, but it’s when the sea horses blow in that things get much more uncomfortable for a guy essentially still learning his trade. Enter Vermaak, perhaps the most underrated player in SA right now. Monumental this season for WP, especially in the last two games, this stocky, brick outhouse is built to scrum. At a wet Loftus, Trevor Nyakane was taught a lesson. At a dry Newlands, it was Dayan van der Westhuizen who was introduced to the textbook. And he will be out to do the same against Du Toit on Saturday. For some reason, we love trying to switch props from loosehead to tighthead in SA. And with the talk around switching Nyakane back to loosehead, Vermaak has an opportunity to put both switches to bed. Promoting a showdown between two props is a bit like the backs talking up a squatting contest – nobody wants to see that! No, Newlands will be packed full of fans eager to see their favourite flyboy dive over for the winning try. With a trophy riding on the outcome, risk management will be a priority and that means the finalists will have spent a fair chunk of this week checking the locks that secure their respective defensive walls. Points will come first from kicks at goal, so the duel between SP Marais and Rob du Preez is certain to be a thriller. But, in an even contest, the trophy will inevitably slide towards the 2018 champions on the outcome of decisions taken during key moments of the match, and that brings us to the shootout between Dillyn Leyds and Curwin Bosch. Leyds is arguably the Currie Cup’s most savvy decision-maker, and he’s built a reputation for coming through in the clutch with big plays. A no-look, flick pass from the deck spawned the game-winning try for the Stormers against the Chiefs last year, and he was at it again in last week’s semi-final, sending Marais in for a vital touchdown in the third quarter. Meanwhile, Bosch boasts the most prodigious array of kicking skills in the country. Field position is everything in tight games and no-one in the Republic can harvest territory like the Sharks fullback. Given time and space, Bosch is also lethal on the counter-attack. The East coast finalists will rely on Bosch to parachute an abrasive Sharks pack into the strike zone. The defending champions will depend on Leyds to contain and respond to that assault. The prudence of each fullback’s decisions will swing the final. 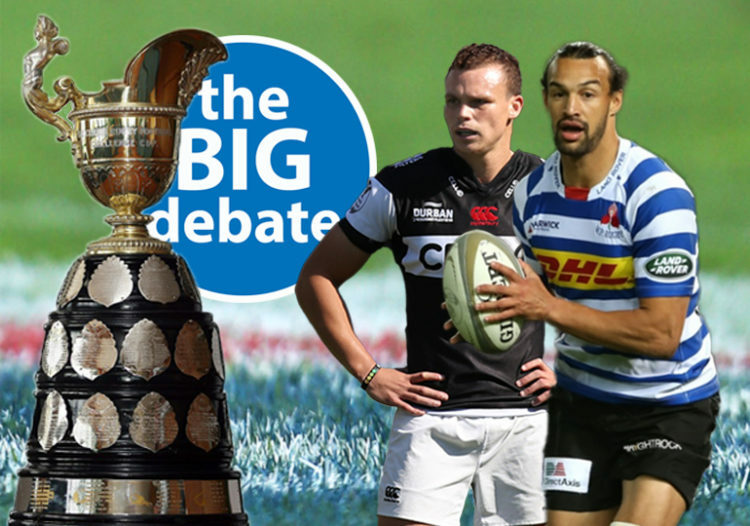 You’ve read what they think, which head-to-head do you think will crown the Currie Cup champions? Shouldn’t be close with all of 7 WP players being called up to the boks against just one lone shark. Just ask Rassie there is no talent in natal. Boyo – get off the bus! Schickerling, Nel and Pietersen and have not been picked for The Boks as yet. They have also played the entire CC. Notse is carrying an injured. Jean-Luc is a Bok! AM and Beast are injured. Add to that Rassie has given plenty of Sharks guys a run in the Bok squad during the international season. So you don’t expect them to be picked? I am referring to the currie cup guys so not sure why you mention beast and Am? Do you want me to list all the WP players being called up? It remains 7/1 so cant imagine anything less than a 50 point win. Luckily for all of us boyo is we wont have that conundrum because Thomas, Schrouder, Bosch & Ward won’t get selected! Tank always good to see you on the boards thanks for engaging us as readers. Let me begin by saying that Coenie has never played under Rassie (and unlikely to make the squad) Akker is fourth choice behind even the retired Britz, Chilliboi is I would say 5th choice so both also not going to make the squad? : So It looks like currently just the one? Obviously no talent in Natal because its all in WP. Should be a stroll in the park for WP eh? For me the key poser WP have is who plays flyhalf. The backline have been superb the entire season then enter Willemse and it’s total chaos! He was unable to deal with the rush defence against The Bulls and his field kicking (the little he did) was poor. The WP pack, as good as they are, need to play from good field positions versus defending scrums and line-outs in their own half. Rob du Preez will be chomping at the bit to take on “The Golden Boy” Willemse. Josh Stander has shown he has the maturity and game for the big occasion. IMHO, play Stander an WP win. Play Willemse and WP can lose this one. Willemse needs to be used as an impact player for this game as he covers F/B and F/H. Firstly sekel rather than kameeldoring! There has been endless reference to last year’s Currie Cup final scruming issues, but some may recall Du Prees taking issue with the ref prior to the first SR match against Stormers as he was not happy with certain illegal aspects. The scrums in that match were fine, so let’s hope Jaco Payper has brushed up and that we see clean scrums this year! Some may also have forgotten that before injury Connie Oosthuizen was the form Springbok tight head. He may be a bit rusty but you don’t lose class! Can’t loose what you don’t have. Yes the clash between Bosch and Leyds will be interesting, but surely if we are talking about possible recognition SP Marais is surely deserving of a national call up. We keep having Damien Willemse forced up our noses, but anyone of Marais, Bosch or Leyds are more deserving! I am sure Rob Du Preeze will run rings around Willemse, as John has suggested, but what I like about him is that he makes it his business to put his players into space. Louw and Ward have been brilliant, but much of that credit should sit with Rob! Sergial Pietersen must surely be close to a look in at national level. He’s been very good this season! Lastly I hope Dan Du Preeze has a good game and gets the nod for EOYT. He has been on fire this season. He upstaged Whiteley last weekend and also In the final SR clash against the Lions earlier in the year. Selectors cannot continue to ignore this!! Marias; Bosch and Leyds are all in the same class. Some superb individual skills; excellent as juniors and at provincial level but unable to ever translate it onto the international stage. Willemse is a rare gem that with proper nurturing can become our own Carter/Barret/McKenzie hybrid with the rugby world at his feet and the ’23 world cup a near certainty for the Boks. He’s unfortunately being wasted just like we wasted Gaffie du Toit and Johan Goosen by shuffling them around and pushing them too fast; in the process confusing him. s only 20 yrs old. Barry very balanced views. No sharks players except Nkosi (estherhuisen already called up) are going to get called up.Petersen,Louw,Bongi,Willemse,Notshe and Schickerling are getting called up. Why we need 6 locks but there is no space for either Du Preez twin I don’t know. Franco Mostert may not be available, because of a contractual dispute. Pieter-Steph seems to be set for No.7. Who are the other five locks? The Du Preez twins need to learn to run, stop wrestling and pass properly. An international has to be able to distinguish between when to pass (in most instances) and when to offload (when there is limited space available). Passes tend to be more controlled than a chicken wing offload, and should thus always be used, when possible. If they learn that, they will be better players. Well Boyo lets hope that Saturday gives them cause for a rethink! It is always subjective because we all want our personal choices recognised but that’s not always possible. In saying that, there are some Red Flags waving at the moment. Lets hope this is recognised and that good sense prevails! I am obviously a sharks fan so bias but really do hope I am wrong and a few sharks boys make the squad and actually get game time.